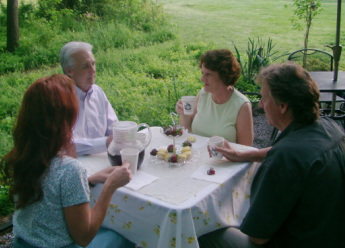 Try our Garden Tea or Garden Luncheon. Enjoy your choice of hot or iced herbal teas or spiced coffee along with a delicious tea cake, scones or pastry. Each one is made fresh with our herbs and spices, giving you a unique and flavorful You'll enjoy items such as; Dill Chicken Salad Swirls, Lemon Balm Scones, Nutmeg Logs, Mint Chocolate Dipped Strawberries and more served with hot or iced herbal teas or maybe a cup of spiced coffee. The shady area provides a nice, comfortable location to gather even during the hottest months. Leave your worries behind and enjoy a relaxing time sipping tea, tasting homemade herbal delights, and visiting with friends. Stroll around the gardens, take a walk down the wooded trail, or visit Ms. Annie's chicken house. Looking for a place to meet with your club, Sunday School class, or with special friends? Planning a Bridal Shower, Baby Shower, or party for a special birthday? Our Garden Patio is perfect for special gatherings and will accommodate up to 16 people. Arrangements may be made for larger groups as well. A special selection of herbal treats, fruit, and teas are set up in a buffet style setting for large groups. Guests are pleasantly surprised with a selection of treats that are wonderfully flavored with herbs and spices. Our menus are planned according to what is in season. Note- We are not a restaurant, but rather enjoy sharing southern hospitality and opening up our home and gardens for others to enjoy. If your interested in learning more about herbs, we offer herbal seminars which will teach you many ways to "Accent Your Life With Herbs". Would you like to learn more about herbs? Learn how to grow and preserve herbs, how to use them for better health, making herbal crafts or using them throughout your landscape. We have seminars that not only enlighten your knowledge of herbs, but you'll be able to tour the gardens and learn first hand about these wonderful plants. We will provide an herbal seminar for your group during your luncheon for an additional charge of $10 for a seminar lasting approx. one hour. Short herbal classes for children during their party is no extra charge. We will be scheduling herbal seminars and classes throughout the year. 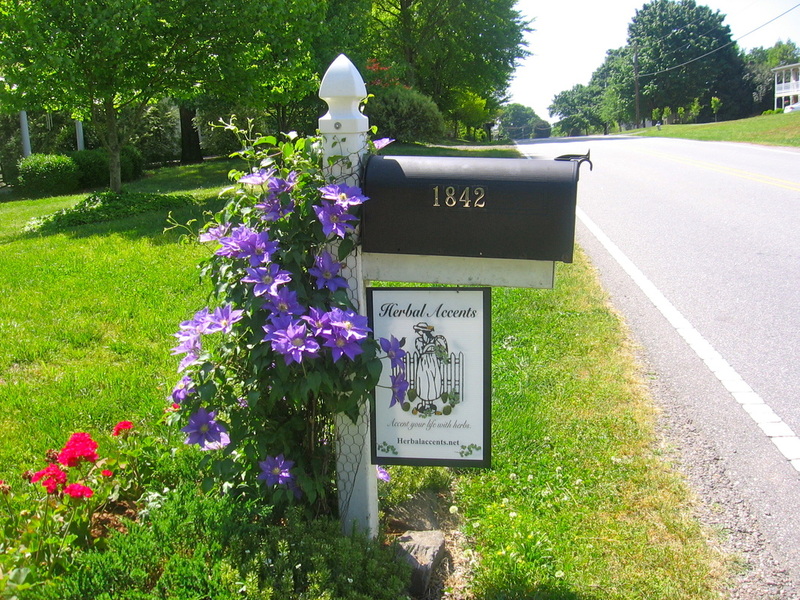 If you are interested in more information on times and cost, please give Mrs. Laura a call at (336)998-1315 or email herbalaccents@yahoo.com. We welcome children to our garden. It is a great place for them to explore nature and learn a little about the wonderful plants God has blessed us with. 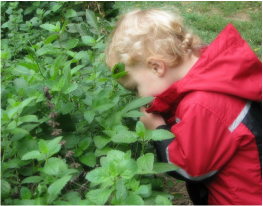 Kids love learning about the fuzzy leaf of Lambs Ear, the amazing smells from Peppermint and Lemon Balm and looking for butterflies, insects, and other garden friends. 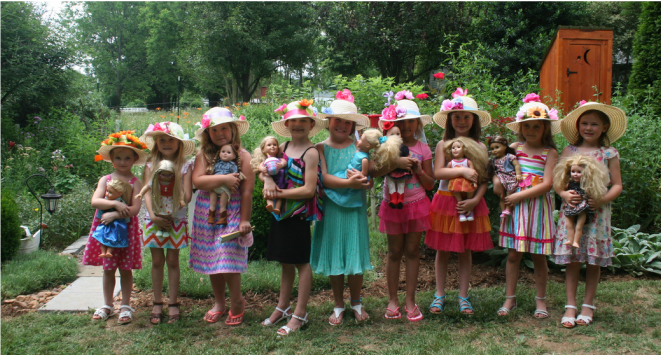 Our Child's Play Tea Time is offered in an atmosphere that is enjoyed by girls and boys of any age. After a bite to eat, kids can make a craft, visit Ms. Annie's Chicken House and feed the chickens, look through the garden to seek out special visitors or take a walk down a wooded trail. Ask about our Children's Herbal Seminars and craft projects. We will work with you to plan the perfect birthday party for the special child in your life. Whether it be a fancy tea party with everyone dressed in their best or just a relaxed time with games and fun exploring the garden with friends. We have the perfect place for you (and without those high prices). We offer garden tea parties and luncheons by appointment only, weather permitting. If it rains, we can accommodate up to 6 inside. Our hours of operation are Tuesday - Friday from 10:00 am - 4:00 pm and Saturdays 10:00 am - 5:00 pm. Most people enjoy luncheons from 11am till 1pm. Check out our Location and Contact page to see what other great places there area available to visit in Farmington to do while your here!